Coach Jason Hurst recounts the history of Lacrosse in central Kentucky and the power that positive coaching has on a team’s success. The Lexington School’s approach has always been student-centric. New endeavors typically begin with interested kids and supportive parents. Lacrosse, the fastest growing sport in America, budded in central Kentucky because of a few students and their dedicated parents. The first Lacrosse club in central Kentucky happened around 1997. The first team was a group of boys at The Lexington School sponsored by Tom Van Meter and Reilly McDonald who had played at Cornell. The Lexington School, with support from Una MacCarthy and Tom Parlanti, said “Let’s do it!” When other schools were not so sure about integrating a new sport, TLS provided the uniforms and field space for this committed group of boys. They recruited Tim Yessin, now a referee for division one games, to help with rules and regulations and Terry Justice, coach of newly-formed Transylvania University lacrosse team, to start the program. Terry’s assistant coach at Transy is former TLS coach Logan Otto. Lacrosse is a small world. At the time of this inaugural central Kentucky middle school program, all other teams were based in Louisville, and some were high school teams that we played. Our first boys team went 6-0 that first year and never looked back. The Lexington School has won a few state championships, numerous league championships, and in my 5-year tenure, we are 61-6 finishing the season as league runner up. Lexington School girls are just as successful led by coach and Lexington School alumnae Meg (Grossman) Sutton who was on the first girls team in Central Kentucky, also at TLS. 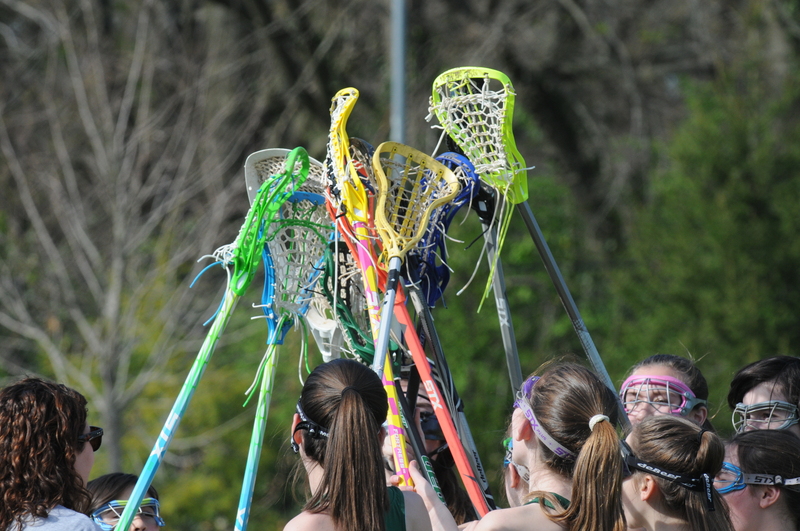 Girls lacrosse started at the same time as the boys, but the girls team has been off and on until three years ago when the resurgence took hold. Former TLS parent Kathy Waldman originally coached girls lacrosse and promoted both teams by helping put together The Lexington Youth Lacrosse Association (LYLA). TLS had the only Middle School girls lacrosse team in our area for several years and had a great deal of success playing high school teams. Our girls are undefeated in their league this season, winning their first league championship 9-2 against EJ Hayes. When I became the Head Coach of our storied program, I brought my own experience as an educator and mentor at the Boys’ Ranch. I played football, basketball, baseball, and lacrosse in high school, and I was fortunate enough to have a number of amazing coaches and mentors who taught me about life through sports. As an homage to them, I strive to be a double goal coach and use the game as a venue to teach life lessons and character education. 70% of athletes quit playing sports by age 13 when winning starts to overshadow participation. At The Lexington School, our lacrosse program focuses on helping our players grow to become better athletes and better people. Our coaches believe that if you coach character on the field, often the scoreboard will take care of itself. We use research-based strategies promoted by the Positive Coaching Alliance, an organization founded by Jim Thompson. Jim Thompson is a teacher who directed the Public Management Program at Stanford Business School and whose philosophy is endorsed by top professional coaches like Phil Jackson and Bill Walsh. Research shows that youth attrition rates in sports are 80% lower for children whose coaches practice positive coaching. Take the most recent list of the athletes on the all-State lacrosse team. Out of 24 players, five athletes attended and played lacrosse at The Lexington School. Of those five players, two boys never played until their 8th grade year. Positive coaching makes a difference. Parent Stephanie Preston has recently acquired a PCA grant that will educate LYLA directors, coaches, parents and athletes on honoring the game by partnering our league with the Positive Coaching Alliance. Despite our success, our program is always looking to improve. Oscar Wilde said, “You can never be overdressed or overeducated.” This is where The Lexington School’s professional development program makes a difference too. The school actively sponsors our coaches so that we can be the best we can be. Coach Joe Conley is a U.S. Lacrosse Men’s Level 1 certified coach, and I am currently 1 of 2 U.S. Lacrosse Men’s Level 3 (highest) certified coaches in Kentucky. We are both PCA Certified Double Goal Coaches ™, and I have been fortunate enough to attend two U.S. Lacrosse Conferences and have recently been hired as a trainer for U.S. Lacrosse’s Coaching Education Program where I have the opportunity to teach and grow the sport by training other coaches. There are so many opportunities for mistake making in sports which is why athletics are a gold mine for teachable moments. As we complete this season and start dreaming about the Southwest trip where we take all our 8th graders, I am again reminded of why I coach. I do it for the kids. I do it to help kids focus on improving their own skills, learn to make their teammates better, themselves better, and to improve the game as a whole. Coaching can teach the game of life that translates into improving yourself, being a leader who helps others flourish, and working to make society better. Lacrosse can be a game of life, and I’m honored to be a part of a program that helps make it so.